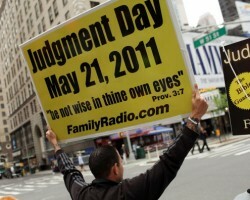 Why are we so fascinated with the May 21, End of the World phenomenon? For many of us, the spectacle of these people with their doomsday signs and complicated calendar calculations provides good comic relief and finger pointing -- "look at the freaks." But as a piece by HuffPost Religion writer Jaweed Kaleem shows, the followers of Harold Camping and his end-time crusade are real people whose conviction of the impending end of the world was seemingly inspired by a deep desire to create meaning and certainty in life within our difficult and chaotic world. Eschatology is the fancy term religious scholars use to talk about the end of the world. It is derived from the Greek word eschaton, which means the last or the end. Eschatological thought in the Bible is consistently marked by a sense of desperation concerning the way the world is, as opposed to the way the world ought to be. Apocalyptic scriptural references anticipate that God's reign will break into this world; a promise that ultimately provides hope in the future as it projects a time of radical departure from the difficult realities of the present. I can see the attraction of this kind of thinking. If the believer white-knuckles it and holds the line, then God will come and break into the world, relieve their suffering, bring justice to an unjust world, and lift those who believed into an exalted role in the new creation. The more I think about the people who are placing their hope in the current end-of-the-world scheme, the less I want to laugh at them and the more I feel compassion for them. My guess is that people who put their trust in these movements have a sense of powerlessness, and they need to believe in a radical solution to their current situation. While the rich and powerful make fun, the followers of Camping and the May 21 movement are largely working-class people who feel that they have less and less of a voice or place in this world. Like buying a lottery ticket, they are placing bets on a instant transformation of their personal situation where the last will become first, and the rich will be sent away empty. But it is not only the materially wealthy who desire these radical changes. People can be in hopeless personal situations with family, or face depression and feel like there is no way out. The end of the world seems like a positive and real option when you are at rock bottom and don't know how to rise up. Or maybe they are people who are simply looking for a reason to make their lives matter in the face of the alienation of our modern world, or the day-to-day tedium and challenges. Seeing a clear end date on the horizon makes every day count. "The kingdom of God is not coming with things that can be observed; nor will they say, 'Look, here it is!' or 'There it is!' For, in fact, the kingdom of God is among* you." We should not expect or hope for some cataclysmic event to bring about a better world -- the Kingdom of God is among us if we have eyes to see it. We can live in God's realm and find meaning through living out the commandments of love, forgiveness and peace. We can find spiritual and psychological relief when we offer prayers of gratitude for the blessings of family, and for the beauty of this world's ecology, which cries out for redemption, not destruction. We can find purpose in our solidarity with our brothers and sisters who are suffering and by working to extend God's blessings to those whom Jesus called "the least of these." Martin Luther King, Jr., taught that the moral arc of the universe is long, but it bends toward justice. God's realm of justice already exists-- we just have to decide to live there. So, let's extend a hand to these folks who are going to be so disappointed on May 22 and invite them to be part of the great work of this life, right here, right now.